Raccoons are amusing animals, but the joke can wear a bit thin when they start making regular nocturnal visits to your property. Raccoons are smart and ingenious, and not shy about taking advantage of any possible food source. That includes your garbage cans, which can be messily pillaged. Bird feeders, pet food, fruit and some vegetables will also be enthusiastically eaten. You might find holes in your lawn from where they’ve been foraging for insects. And that’s just from visiting raccoons. If they decide they like your place enough to set up home there you have real problems. Raccoons like to make dens in isolated spots, and if you have outbuildings they’re a prime choice. They’ll also happily settle in lofts and attics, and they really love crawl spaces. Once they’ve established themselves they’re very hard to get rid of so the first thing you need to do is raccoon-proof your property. 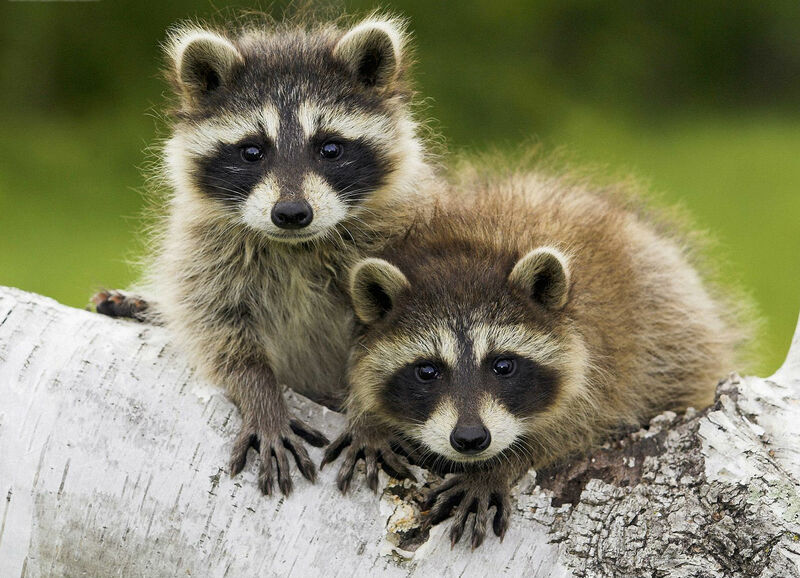 Block up any gaps that lead into crawlspaces or buildings, and do it firmly – raccoons are strong, and have very versatile paws. Replace rotted boards and nail up loose ones. If prowling raccoons find a weak point they’ll rapidly break in, and they can do a lot of damage in the process. They can also open unlocked doors, so don’t leave any outbuildings open and accessible. Once your buildings are secure look at ways to keep them outside your property. The first thing to do is remove any sources of food. If you feed pets outdoors, clear away their bowls and any spilled food before sunset. Make sure garbage cans are well secured. Raccoons can knock lids off, even if you weigh them down with a rock, and often knock the cans over as they rummage for food. Depending on what kind you have you might be able to get clamps to hold the lid down. Bungee cords fastened to the handles can also be used to secure it, but raccoons might chew through those. A chain and padlock will keep them out too. Alternatively you can buy or build an enclosure to keep animals away from your garbage. Motion-controlled lighting can deter raccoons, but they’re curious animals and it tends to lose its effect quickly; they soon learn that the light won’t do them any harm. The same problem applies to using noisemakers like radios. A motion-activated sprinkler will deal with most critters but doesn’t bother raccoons so much. You’re probably better with some sort of chemical deterrent. There are commercial ones available, and many brands will scare off anything from raccoons to rats. You can also make some at home that are worth experimenting with. Try boiling a handful of chopped chillis in a gallon of water then stirring in a cupful of cayenne pepper; let the mixture cool then sprinkle it round the borders of your property or round any crops you want to protect – corn is a raccoon favorite, so if you’re growing any it will definitely need protection. Sometimes no deterrent works and it’s necessary to physically remove a raccoon. The recommended method for this is live trapping; buy a cage trap, bait it and leave it in an area the raccoons spend time in. Almost anything edible will do for bait – sardines, fruit or bread all work, and a couple of ears of fresh corn will usually be effective. Check the trap every morning and, if you have a raccoon in there, take it well away from your home and release it. At least ten miles is a good distance. One thing to check before setting traps is whether there are cubs around. If a raccoon has moved in between early summer and fall there’s a chance that somewhere on your property is a den with up to five young. Trapping and removing the mother will kill the cubs, which is generally undesirable – especially if the den is in your crawlspace. Raccoons are ingenious and persistent pests, and can be a real nuisance. They’re quite intelligent so often harder to deter than other small animals. Sometimes the only effective solution is to call in a professional, but it’s definitely worth raccoon-proofing your home and trying these simple remedies first. There’s a very good chance you’ll manage to drive them off.